What is a Crown Wash? Chimney Cap? Do I need mine repaired? A crown wash is a masonry coating a-top a brick, block, stone or stucco chimney. It is a vital to have one, intact and functional. What function? Crown washes keep water from entering the chimney to prevent rapid deterioration during the freeze thaw cycles. 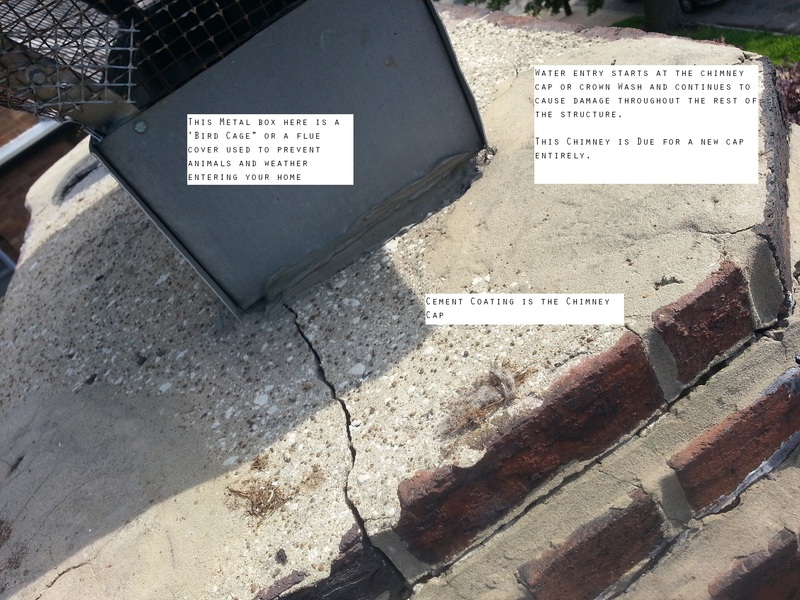 Crowns and caps with cracks are the first point of water entry in any weather exposed chimney. If you’re in need of this service or repair, you’re in luck because you’re only a click away from Contacting a Chimney Repair Professional. Chimney Cap: Same as a crown-wash… sometimes. Chimney caps refer to either a masonry coating(ie crown wash) or covering, such as brick, block or stone at the top portion of a chimney. While the functions are essentially the same, they can vary in material shapes and sizes. Chimney Cap: A metal (aluminum, galvanized steel, & copper) Covering a chimney flue or chimney cap to prevent weather and animals from entering the flue making way into your home. Most common animal entry in St. Louis? Bats! Scary, huh? Let us disable that fear, give us a call for a quote today. Chimney Tuckpointing Repair Costs, How-tos Etc. Still not finding what you’re looking for? Give us a call, text or email, we have the answers and we’re always looking for new topics to Blog about. We’d be glad to hear from you! Posted in Chimney Restoration and Repair, St. Louis Tuckpointing & Brick Repair and tagged bids, block, Brick, Chimney, company, estimates, repair, Restoration, St. Louis, stone, tuckpointing on February 24, 2014 by Jacob Thompson.